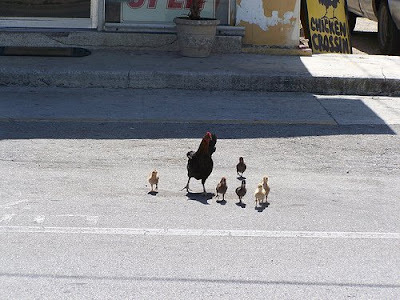 the chickens crossed the road....and they had to say. DR SEUSS: Did the chicken cross the road? Did he cross it with a toad?Yes, the chicken crossed the road,But why it crossed I've not been told. JERRY FALWELL: Because the chicken was gay! Can't you people see the plain truth?' That's why they call it the 'other side.' Yes, my friends, that chicken is gay. And if you eat that chicken, you will become gay too. I say we boycott all chickens until we sort out this abomination that the liberal media white washes with seemingly harmless phrases like 'the other side. That chicken should not be crossing the road. It's as plain and as simple as that. BILL CLINTON: I did not cross the road with THAT chicken! What is your definition of chicken? COLONEL SANDERS: Did I miss one? Where did that sucker go? AL SHARPTON: Why are all the chickens a colorless white? We need some black chickens.